Monkey see, monkey do. Everyone and their mother (laughing out loud!) is coming out with a wireless iPod sound system these days and Intellitouch is the latest company that wants your money in that regard. 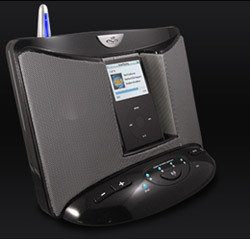 Its Eos iPod dock can wirelessly transmit your summer beats up to 150 feet indoors; the range magically doubles outdoors. The dock is able to send music to four speakers at a time and uses all tricks of the trade to maintain fidelity like SRS WOW and bass enhancement. The Eos costs $300, with additional speakers coming in at $150. Oh, and Intellitouch would like to remind you that “Eos is designed as an ambient music system and not a system to replace you home stereo.” Faith in your product, right?